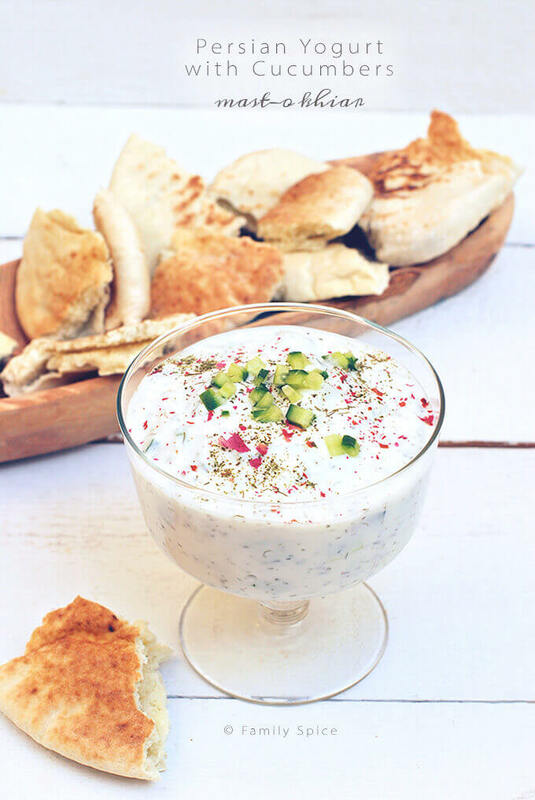 Keep things cool and exotic with this ridiculously easy to make Persian Yogurt with Eggplant Dip with Mint (Borani-e Bademjoon). When you think of fall, you imagine the changing of the seasons. Here in the U.S. this means the end of warm summer nights and the beginning of cool fall evenings. But in San Diego, summer lingers a little longer. We often have hot and dry Octobers which finds us in the heart of fire season. So while everyone else is enjoying hot stews and warm bowls of soup in cool weather, we are still grilling, enjoying ice cream and keeping cool with cold delights. With the drought this year, we did not plant too much in our summer vegetable garden. Instead, I will reminisce about the eggplant and tomatoes we enjoyed in summers past. During these last few weeks of warm weather, many Southern California gardens are still producing summer produce. That is why this year, to celebrate fall and Mehregan (the Persian fall holiday), I decided to keep things on the cooler side. Persians absolutely adore eggplant, and I do, too. Don’t let the texture prevent you from enjoying these flavorful vegetables. I no longer purchase the fat, American eggplant you find in the grocery stores. I prefer the smaller eggplant varieties: Italian, Japanese and even the little round baby eggplants. Their skin is thinner and edible. 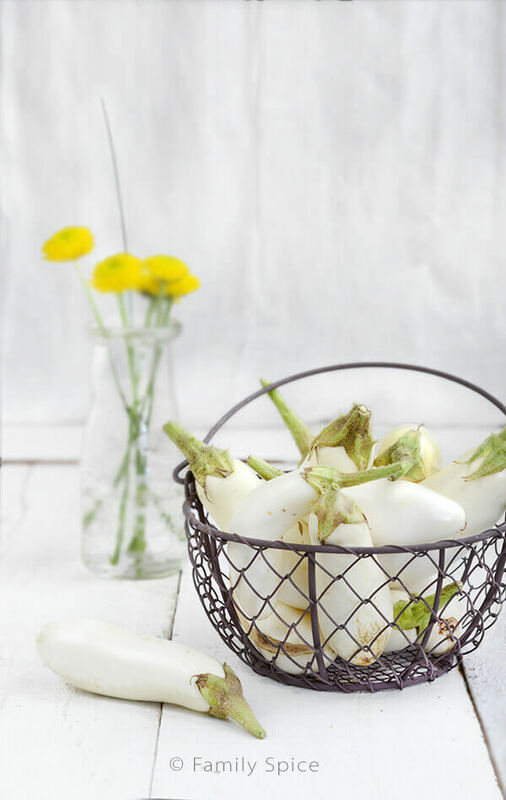 Last year, I grew those white beauties, Ghost Eggplants, pictured above. Now that is fitting for this October month, right? 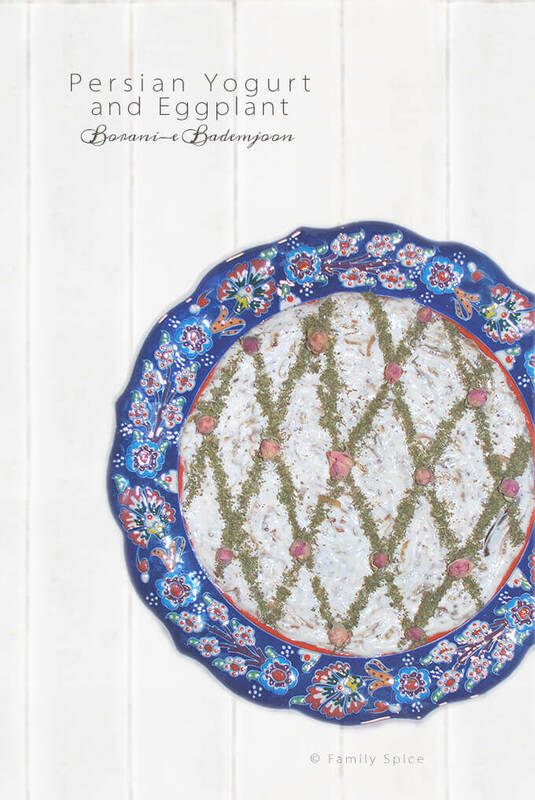 Today’s dish, Persian Yogurt with Eggplant Dip (Borani-e Bademjoon), is a wonderful appetizer to serve with lavash or pita wedges. Whichever variety of eggplant you use, you can fry or bake your eggplant. Since eggplant soaks up a lot of oil, I prefer to bake it, especially since it will be mashed afterwards and mixed with the other ingredients. My mother-in-law decorated and garnished the final dish for the picture. She has patient and delicate hands compared to my clumsy, chunky hands. It is garnished with dried mint and dried rose petals. Gorgeous isn’t it? Want more yogurt inspiration? How about Persian Yogurt with Cucumbers? If you are fully engrossed in fall flavors, no worries. Last year for Mehregan I shared my Persian Butternut Squash Stew (Khoresht Kadoo). But my fellow Persian Food Bloggers have a slew of recipes to celebrate fall. Be sure to check them all out! Place eggplants on oven rack and bake until done, 30 minutes to 1 hour, depending on the size and thickness of your eggplant. Be sure to put a tray underneath the eggplants to catch drips. Remove eggplants from oven and allow to cool. Once cool enough to touch, cut in half and scoop out and mash the soft flesh. Reserve in a bowl. When onions start to soften, reduce heat to medium-low and cook until onions brown and carmelize, about 30 minutes. Cover and cook for 5 minutes then turn off the heat. Transfer dip into serving bowl. 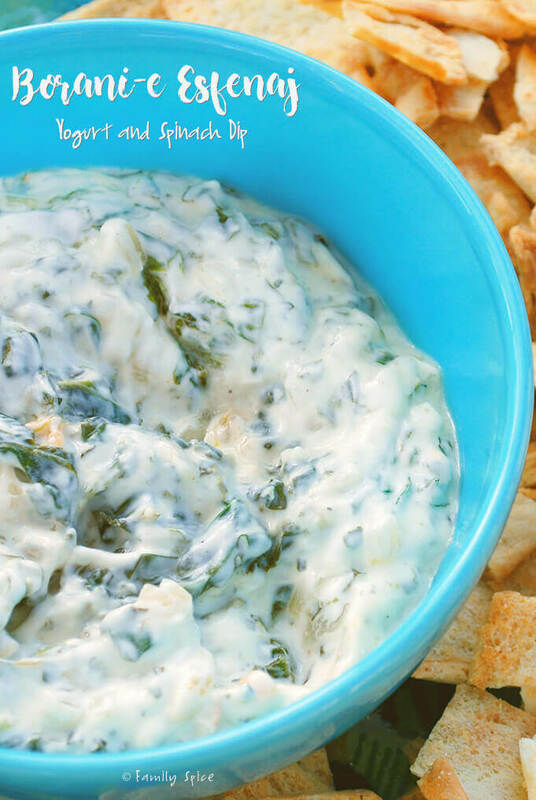 Serving Suggestions: Serve with pita bread, chips and/or an assortment of vegetables. Cooking Tips: Traditionally, middle-eastern yogurt is thick and a little sour. If you can not find authentic middle-eastern yogurt, you may need to adjust the seasonings. Delicious dish and beautiful presentation, thank you and your mother in law for this recipe. Such a gorgeous dish! Laura, this is tempting me so much right now! I love it and your mother-in-law made such a pretty decoration on top. It is definitely prepared with love. Happy Mehregan! Laura, what a gorgeous presentation and I love the albino eggplants! Am on a lengthy blogbreak but just had to pop in to say what a beautiful recipe this is: saw the picture come up on another Mehregan post and am glad I came to look! 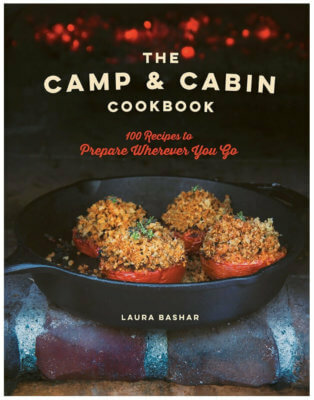 [Just could not find eggplants on your recipe?] . . . . And tho’ I also love the smaller varieties I have never come across the beautiful ‘ghost’ ones . . .
OMG Laura!! This looks sooo gorgeous and delicious. I have never had this before and must absolutely try it. Thank you! I made this last night (without the gorgeous garnish; I wish I had your mother-in-law’s skill!). I used 2% Greek Yogurt (no labneh to be found) and added some extra garlic. It’s absolutely amazing spread atop warm pita and tastes much richer than it actually is. I love it and I’m currently busy thinking of other ways to enjoy the leftovers. I’m so glad you made it and liked it! You can’t go wrong with extra garlic. You can also dip vegetables in it, like carrots, celery and radishes. Indeed, we Persians adore eggplants! I love all kinds of boranis, especially one made with eggplants… and yours is one fine borani’s bademjan! I must also compliment your mother-in-law who gave it a beautiful final touch. Beautiful!! Your mother-in-law did a great job decorating. I wonder if ghost eggplants are less bitter than the regular kind? I didn’t find the ghost eggplants to have a different flavor than the other eggplants. But these were more firm and had less seeds. But I’ve always been partial to the smaller varieties!